“Bach: Music in the Castle of Heaven” is an unusual book—part biography, part exegesis of Bach’s choral masterpieces (the cantatas, masses, oratorios and passions). Mr. Gardiner organizes it in 14 loosely related chapters, or “spokes” of the wheel that is Bach’s life and music. In a chapter on Bach’s contemporaries Handel, Scarlatti and Telemann, Mr. Gardiner charts Bach’s path away from opera and toward sacred music—a decision that considerably limited his fame as a composer during his lifetime. Elsewhere, Mr. Gardiner gives a fascinating account of the prevailing decorum during church services, concluding that the gossiping, late arrivals and red-carpet-like entrances during the music must have been enormously frustrating to the composer. Throughout these explorations, Mr. Gardiner writes in the refreshing voice of a man who has studied and performed Bach’s music for decades. He joins his countryman, the tenor Ian Bostridge, in the tradition of the musician-scholar who brings arresting insights and new perspective to musical study. After all, conducting Bach, as Mr. Gardiner notes with not a little pride, means leaving aside dry academic debates and committing oneself to an interpretation. Performers can’t waffle forever: When the curtain rises, they must draw breath and sing. Another key to Mr. Gardiner’s success has been the use of period instruments. His English Baroque Soloists use cornetts and sackbuts alongside cellos and violins that are played with baroque-style bows. Historically informed musical practice can become a fetish, and it receives plenty of scorn from traditional symphony orchestras. Mr. Gardiner clearly realizes this and regrets it. As a consequence, his period practices are irreverent and nowhere dogmatic. Yet there is, he insists, an important difference between period musicians imbuing Bach’s music with fresh energy and purpose and symphonists dutifully sawing away, hitting the notes but missing the point. Throughout his career as church organist, choirmaster and court composer in the German cities of Weimar, Cöthen and especially Leipzig, Bach stretched the boundaries and conventions of the day. Rather than some fusty old grouch in a wig, Mr. Gardiner’s Bach is a true radical. He rebelled against the limits of what was liturgically appropriate, harmonically acceptable and musically conceivable, employing bold new instrumentation, dissonance and strikingly modern harmonic progressions. Exploring one early cantata, Mr. Gardiner suggests that a Berlioz or a Stravinsky would more likely have landed on a particular phrase of Bach’s involving descending notes and syncopated rhythm. Bach’s radicalism certainly shone through his most dramatic works, the St. John and St. Matthew passions. Mr. Gardiner carries on a spirited argument with the listeners who in Bach’s day preferred Handel’s operas and those who in the years since have overlooked Bach’s contribution to musical dramatization. Along the way, Mr. Gardiner expresses a little winking scorn for opera as a form, calling it “preposterous, expensive, and prone to diva tantrums and self-indulgence.” (These criticisms are the more persuasive coming from a former director of the Opéra National de Lyon.) Yet the broader point is worth making: Bach’s dramatic settings of Christ’s betrayal and crucifixion equal anything set for the stage. 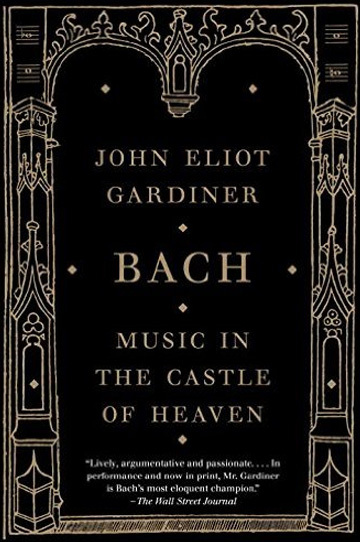 Although Mr. Gardiner has made his career as a performer rather than a scholar, “Bach: Music in the Castle of Heaven” showcases remarkable erudition. He illustrates his arguments with references to T.S. Eliot and Caravaggio and fills the footnotes with ever-curious digressions about history, culture and politics. And while he emphasizes the scores, Mr. Gardiner is up-to-date on Bach scholarship. He acknowledges a debt to their research but freely disagrees with some of the conclusions drawn by Bach’s most eminent biographers, such as Christoph Wolff’s assertion that Bach attended school among a well-heeled and cosmopolitan group of boys. Nonsense, argues Mr. Gardiner: They were thugs and ruffians. Bach’s music is one of mankind’s greatest achievements, and his genius touches upon matters eternal and profound. His choral music is less well-known than it should be—especially the cantatas, which Gardiner lauds as “gripping musical works of exceptional worth.” Spurred by “Bach: Music in the Castle of Heaven,” many listeners will discover them for the first time. In performance and now in print, Mr. Gardiner is Bach’s most eloquent champion, just as Bach is God’s.